Michael Cohen once was Donald Trump’s lawyer, a man he could count on to “fix” things gone awry. He’s now one of the president’s worst nightmares. 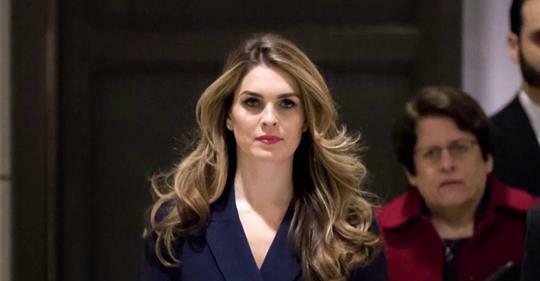 Hope Hicks once served — albeit briefly — as communications director for the White House occupied by Donald Trump. Now she’s gone over the hill, telling congressional Democrats she wants to cooperate fully with them. Cohen likely was motivated to turn against Trump by a prison sentence he received after pleading guilty to lying to Congress; he is set to start a three-year federal prison term soon. He might, it should be noted, get that sentenced reduced. Hicks isn’t driven by that necessity. She has told House intelligence and judiciary committee members she lied on Trump’s behalf. She says she’s done lying. Oh, my. It seems as if this saga has no end. There’s no bottom to this pit. It sinks lower and lower. Whether the special counsel, Robert Mueller III, provides anything of substance in his investigation of The Russia Thing now seems almost a moot point. There might be other information coming forward from former friends, political allies and associates of the president of the United States. Cohen, Hicks . . . who else is out there? I just cannot get past Donald Trump’s history as I listen to his tough-talk in the moment. The president told Breitbart News that the military is on his side, as are the police, and — of course! — the “Bikers for Trump.” He said they don’t usually play tough, but they might if things don’t go their way — and favorably for the president. Then it would get “very bad, very bad,” he said. Do you remember the president’s reaction to the massacre at Parkland, Fla., when a gunman opened fire, killing several high school students and teachers? He criticized the deputy sheriff on duty at the campus who reportedly waited outside while all hell was breaking loose. Then the president said he would have gone in with guns-a-blazin’. This is the same fellow who when he was much younger had the chance to take up arms against our nation’s enemies in Vietnam, but then developed a case of bone spurs. A doctor issued him permission to obtain several medical deferments that kept him far away from the Vietnam War. Oh, and then we heard just recently from his former lawyer/fixer/confidant Michael Cohen, who said Trump once told him, “Do you think I’m stupid? I wasn’t going to Vietnam.” Those of us who did go to ‘Nam when the guns were shooting and the bombs were falling well could have taken offense at the “stupid” remark. 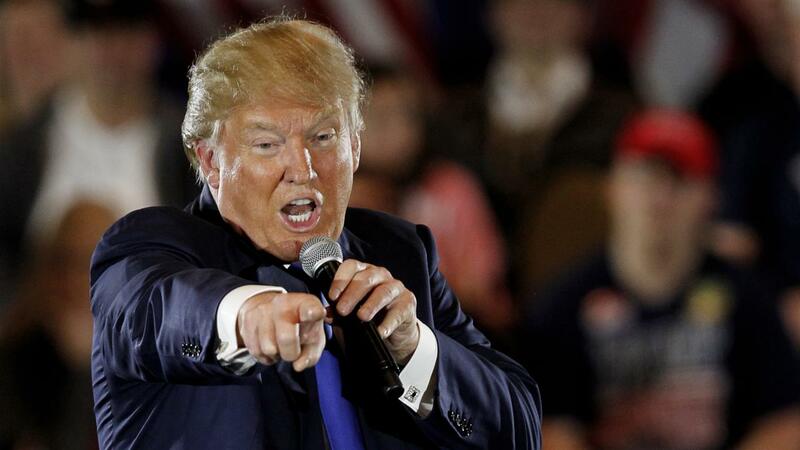 Donald Trump’s toughness, I will venture to say, is a figment of his own narcissism. Trump blames Cohen hearing for failed N. Korea talks? Huh? This one doesn’t compute, Mr. President. 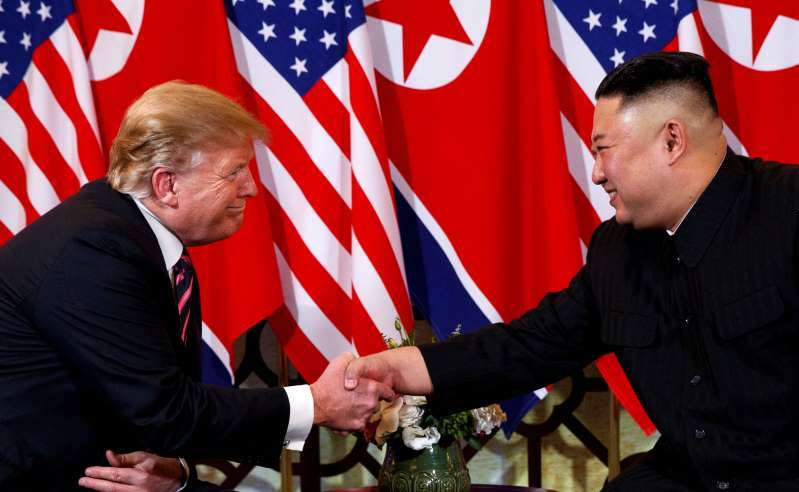 You travel to Hanoi to meet with your new BFF, North Korean tyrant Kim Jong Un, expecting to score some kind of monumental “deal” to persuade Kim to do away with his nuclear weapons. The deal making falls through. You walk away. I get why you did it, since you couldn’t get the deal you wanted from Kim. Then you blame the House Oversight and Reform Committee hearing on Michael Cohen, who spent the day calling you a racist, cheating con man. He called you a shmuck, Mr. President. Many of us agree with your former friend/confidant/fixer. His testimony didn’t undermine your talks with Kim Jong Un, Mr. President. He was talking about matters far removed from issue at hand in Hanoi. So, why are you laying blame at the feet of Democrats? I heard your statement about criticizing the president while he — I mean, you — are overseas negotiating with an overfed tyrant who kills his own people through starvation, torture and assorted methods of execution. The blame for the failed summit rests with you and Kim Jong Un. Not on Democrats, not on Cohen, not on the brutal storm that is ravaging the middle of the country. Take responsibility for the times you fall short, Mr. President. Stop looking to lay the blame at the feet of others. House doesn’t need a criminal charge to impeach, however . . .
Donald J. Trump put his cheesy side on full display at the Conservative Political Action Conference meeting today. 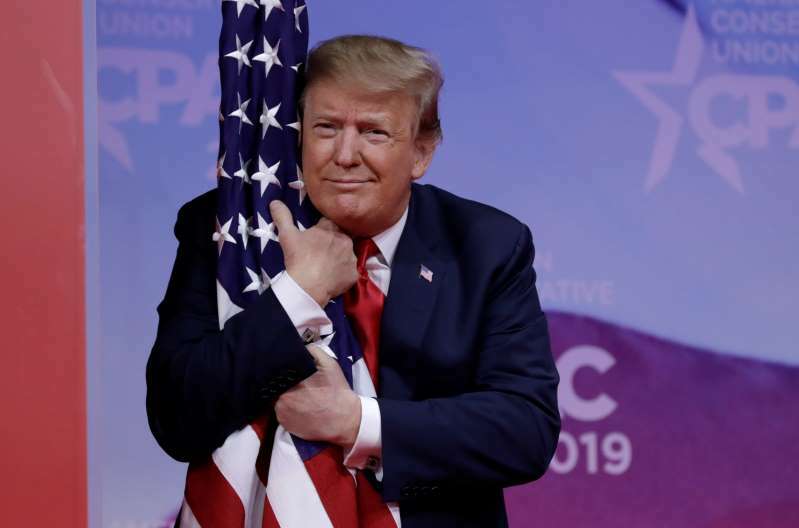 He hugged Old Glory as he walked onto the stage before delivering a two-hour harangue filled with four-letter words and assorted demagogic statements about his foes. OK, I say all that as a predicate for what I want to say next. It is that Michael Cohen’s testimony this week before the House Oversight and Reform Committee opened the door to possible criminal charges being brought against the president of the United States. The president’s former lawyer/confidant dropped the names of individuals who might know a lot about Trump’s financial dealings and whether they involve possible criminality. Let’s revisit an earlier inquiry into whether to impeach a president. In 1974, the House Judiciary Committee voted to impeach President Nixon on obstruction of justice and conspiracy charges related to the Watergate scandal. I want to note that the committee did not impeach the president on the basis of any criminal charges. None had been brought. President Nixon did not break any laws before the House panel approved the articles of impeachment. 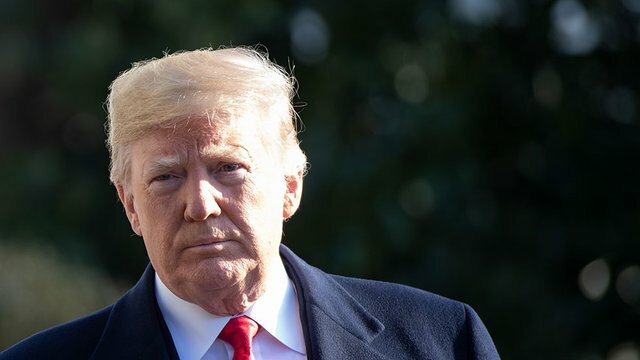 Republican lawmakers scurried to the White House and informed the president that he had no support in the Senate, where he would stand trial once the full House impeached him. Twenty-five years later, the House of Representatives impeached President Clinton largely on the basis of a single criminal charge: perjury. The president lied to a grand jury that asked him about his relationship with the White House intern. Donald Trump’s troubles appear to eclipse those that ensnared Clinton in an impeachment and a Senate trial (where he was acquitted). As for the Nixon impeachment inquiry, I just want to reiterate that the president was not charged with a criminal act. This is my way of saying that Donald Trump might be wading into some mighty deep doo-doo. No amount of flag-hugging is likely to do him any good. Michael Cohen’s testimony before the U.S. House Oversight and Reform Committee produced a bushel basket of explosive moments. One of them involved Donald J. Trump’s tax returns. Cohen talked to the committee about his role as a public spokesman for Trump, for whom he worked for a decade. 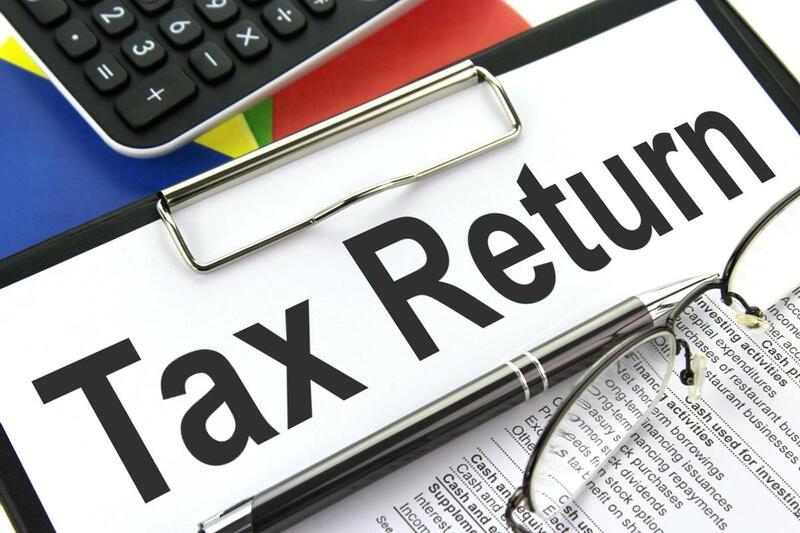 The issue of the president’s tax returns came up during the campaign. Trump decided to buck a political tradition established four decades ago. He didn’t release those returns, unlike other presidents and presidential candidates. He said the Internal Revenue Service was auditing his tax returns. It’s all normal, he said. That was three years ago! Cohen told House committee members that he sought from Trump a copy of the letter from the IRS informing him of the audit. None was forthcoming. And that brings me to the point: I do not believe Trump was being audited by the IRS. He hasn’t produced any sort of document telling us that the IRS was auditing him. I believe he made the “audit” pretext up. Cohen was seeking to do the job for which Trump hired him, which was to fend off questions about the audit. Cohen sought some documentation to substantiate what he was telling the media about his boss’s tax returns. He didn’t see anything. Does that tell you — as it tells me — that Donald Trump fabricated the audit as a ruse to keep the tax returns away from public view? So, there’s the question: What is this man hiding from us? Do elections have consquences? Yep, they sure do! 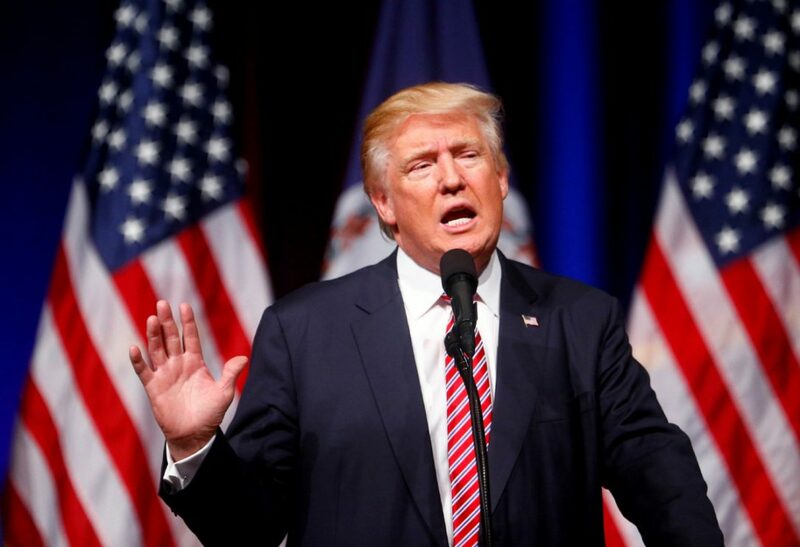 Donald Trump’s election as president of the United States demonstrates it; he has appointed two justices to the U.S. Supreme Court, swinging the court balance to the right. Yes, the 2016 election has consequences. So does the 2018 midterm congressional election. We saw the consequence of that election today. Democrats took control of the U.S. House of Representatives in the midterm election. And today, the Democrats convened a hearing of the House Oversight and Reform Committee and received the testimony of Donald Trump’s former lawyer and fixer, who then proceeded to tell the world that the president might have broken the law. How? By writing a reimbursement check for what might have constituted an illegal campaign expenditure relating to the payment to an adult film actress who allegedly had a fling with the future president. We would have heard none of this today had Republicans maintained control of the House in the midterm election. They didn’t. The Democrats took control. They have the chairman’s gavels now. Let there be no doubt that elections have consequences. At times those consequences can be profound. I believe we witnessed one of those profound events today. Donald John Trump might have insulted the intelligence of millions of Americans of a certain age, according to his former lawyer/confidant Michael Cohen. 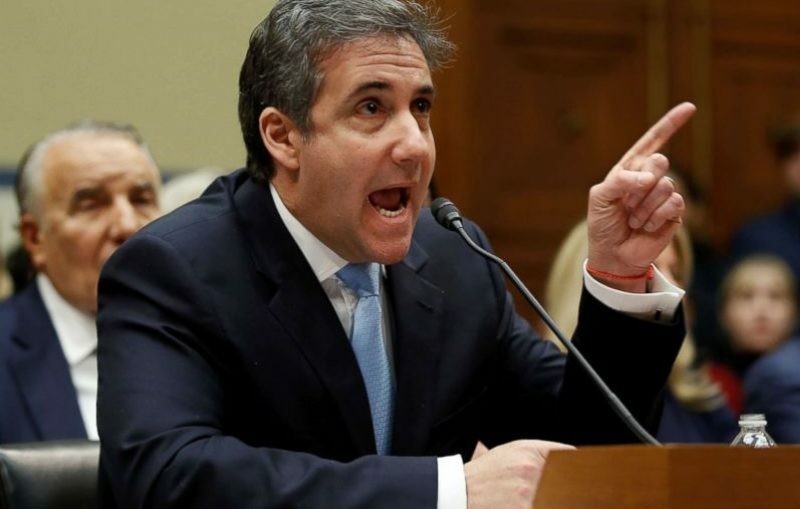 Cohen testified today before the U.S. House Oversight and Reform Committee. He covered a lot of territory during the seven or so hours of testimony he gave. One of the things he disclosed was the medical deferment that young Donald Trump received from a doctor who managed to keep him out of military service, which might have sent the young man to Vietnam to fight in the war many of us remember. Darn. I thought I was a smart guy, even though I went to Vietnam in the spring of 1969. You see, the U.S. Army brought me into its fold in August 1968. It taught me basic soldiering at Fort Lewis, Wash., then sent me to Fort Eustis, Va., to learn how to maintain OV-1 Mohawk aircraft. My advanced individual training company got orders for Korea, but I had my orders canceled so I could deal with an injury I suffered during training. What did I do then? I asked for duty in Vietnam. Wouldn’t you know it? The Army granted my request and sent me to Marble Mountain, Da Nang, South Vietnam. Trump? He stayed home, getting deferments for bone spurs the doc supposedly said he had. Cohen told committee members that he needed the medical records to show to reporters who would ask about the deferments. Cohen was a spokesman for Trump when he was campaigning for president. A lot of us who did go to war a half-century ago might think of another pejorative term to hang on the president. The word “coward” comes to mind.